Multimodal-Spectroscopy (MMS) research team in the Biomedical Optics Research Laboratory at the Medical Physics and Biomedical Engineering department at University College London (UCL) led by Dr IliasTachtsidis has designed CYRIL, a compact broadband near-infrared spectroscopy(NIRS) system, to monitor brain tissue physiology non-invasively in newborn babies. 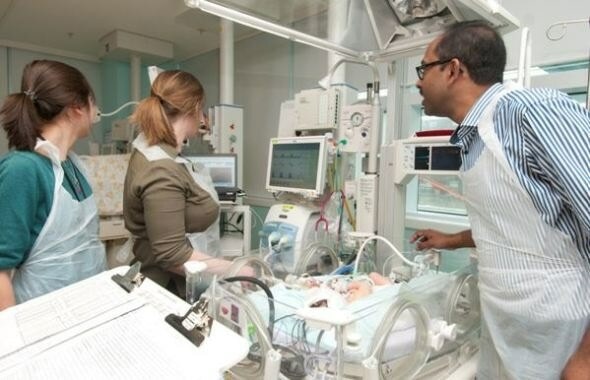 In the neonatal intensive care unit, two medical engineers, Isabel de Roever and Dr Gemma Bale (left), work with neonatologist Dr Subha Mitra (right) to monitor a baby with the optical instrument, CYRIL. CYRIL, a portable broadband NIRS system, is small enough for use in neonatal intensive care units (NICU) and accident and emergency (A&E) rooms, was designed by the team at UCL and is currently being used in preclinical studies looking for future neuroprotective therapies and in clinical studies in the neonatal unit in University College London Hospital. During birth, disruptions in blood and oxygen supply to baby’s brain can stop it from working properly. This lead to an acute injury to the developing brain and ultimately can lead to significant disability and death. While many babies make a partial to full recovery, some will develop cerebral palsy and behavioral problems. Detecting and monitoring newborn brain function following an insult is extremely important for clinicians, to understand the effects of the injury and possible future neurodevelopmental outcome for the baby. CYRIL offers a safe, non-invasive way of shining light through the brain tissue of a newborn baby and detecting its function with a sensitive digital camera. This reveals detailed information about oxygen and metabolism levels, providing vital and potentially life-saving information for doctors. The research team have demonstrated that the metabolic information collected by CYRIL can identify brain injury severity. By using hundreds of wavelengths of light, broadband NIRS measurements of cytochrome-c-oxidase (CCO) can yield crucial information about brain metabolism at the cot side. CCO is a key enzyme in the mitochondria of cells and catalyses more than 95 per cent of oxygen to produce energy, providing information about oxygen consumption at cellular level. CYRIL simultaneously measures changes in brain oxygenation and hemodynamics via estimation of the changes in hemoglobin concentration; in addition to oxygen utilization via the measurement of the oxidation state of cytochrome-c-oxidase (CCO). Dr Tachtsidis, the team’s leader, says that future work will focus on transforming these optical devices to compact clinical instruments that can be operated by medical doctors and nurses to provide real-time information on the brain function. The team also launched public engagement platform called MetaboLight (www.metabolight.org) to share their research and encourage the students of present to become the next generation of medical physicists and biomedical engineers. The mission of the MMS Group is to develop a novel cot side brain imaging tool by combining broadband near-infrared spectroscopy with other physiological measurements. This will enable the fusion of anatomical information and regional measurements of changes in cerebral tissue oxygenation, oxygen utilization and energy metabolism. This instrumentation and technique will be able to characterize and monitor the progression and treatment of brain injury in babies, children and adults. CYRIL is a novel broadband NIRS system which has shown the potential to become a fantastic bedside neuromonitoring tool for babies that already has or prone to develop newborn brain injury. It has the ability to identify babies based on injury severity early on following hypoxic ischemic encephalopathy (HIE), can give us an early diagnostic direction in cases of neonatal stroke and also gives as important information regarding the pathophysiological changes in brain during neonatal seizures.